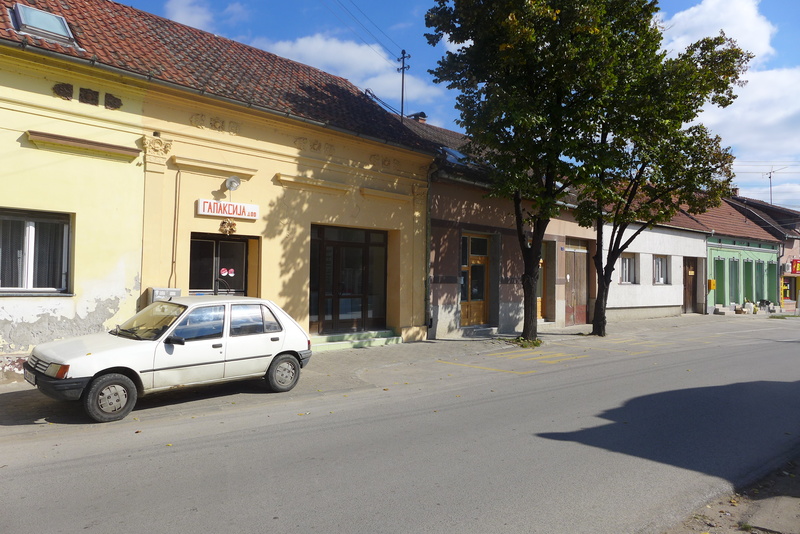 Hopping off of the bus about 20 minutes outside of Novi Sad, I was immediately positive that I had gotten off too early, despite the driver’s affirmative muttering of “da, da, da” to my question “Da li je ovo Sremski Karlovci?” Was this the town of Sremski Karlovci? The only thing I knew about the place prior to arriving was that it existed, and a few friends from Belgrade swore by its charm and beauty. The three other people who were on the early morning bus with me had all gotten off, dispersing in different directions from the practically nonexistent bus stop, so I figured I was close enough. A colorful panorama of early autumn leaves decorated the only street that led from the main road into town. In the distance, several church steeples protruded among the rooftops that blanketed the surrounding hills. I figured that the highest tower, situated less than a kilometer away, would be a good start, and started heading in that direction. As I made my way into town, it seemed that, despite appearing relatively desolate, the daily activities were already well underway. Locals were working in their front yards, women were returning from the market with beautifully stocked, overflowing baskets, elderly men were casually cruising through the narrow streets on rusty bicycles, and the pekara on the corner overwhelmed the block with the delightful, familiar smell of fresh burek. After having spent a significant amount of time in the busy, energetic streets of Belgrade and Novi Sad, this was immediately a refreshing change of pace. 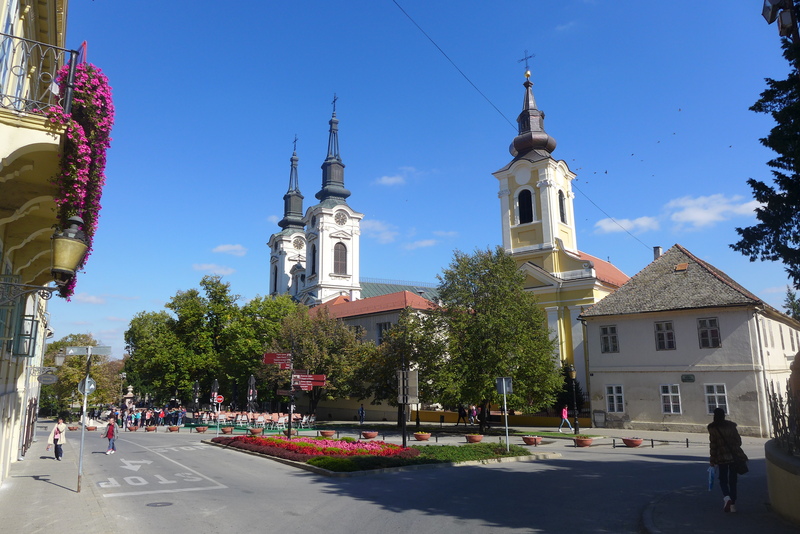 However, despite having very few people around, Sremski Karlovci immediately felt much more vibrant and warm than these two cities, a reality that is hard to imagine. I became aware of this even before reaching the end of the block, just by observing the interactions of about half a dozen locals. There was a middle aged couple on an old, green motorcycle who stopped every forty meters, giving a quick honk and chatting briefly with each one of their neighbors. Before whizzing off towards the main road, they spoke with an old man in the middle of the road who wore a weathered, bright green jacket and a dark blue beret. He gripped tightly to a wooden cane, leaning with all of his weight on his right arm as he turned away from the departing motorcycle and excitedly continued his conversation with a young carpenter. 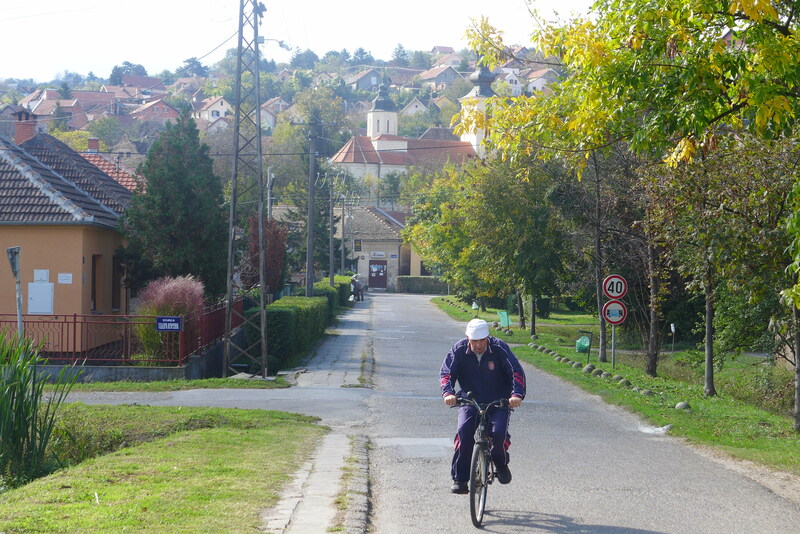 I smiled as I walked by and said “dober dan”, at which point the old man turned to me and began saying something in Serbian. In the limited, basic conversational Serbo-Croatian that I had developed during my few months in the Balkans, I wished him a good morning and stated that I was learning [Serbian] slowly. He took my extended hand in a gentle grasp, shifted his weight to his other arm, and without releasing his grip or breaking eye contact, he asked me my name. I replied “Kerem,” to which the old man gave such a happy smile, bowed and brought the back of my hand to his forehead. He held my hand there for several seconds. Surprised and not sure how to respond, I returned the kind gesture, and we stayed in that position for a while, smiling and filling in the gaps of our language barrier with the nonverbal bond that formed between our gazes. He had such a buoyant, lighthearted expression on his face, as if one of his sons had returned home from a very long journey, and in that moment, I fell in love with Sremski Karlovci. I wandered through the historic, charmingly worn streets until I found the center, and spent the following few hours getting lost in the calm flow of the daily local happenings. Kids played in the streets, biking and chasing pigeons as their mothers chatted nearby over coffee. A student took a walk with her professor through the courtyard of the local university, discussing what must have been something unrelated to studies as they were both constantly laughing. Two dogs chased a street cat through the gardens of the main church, whizzing by and distracting me from the soothing, quiet background noise of the central square. 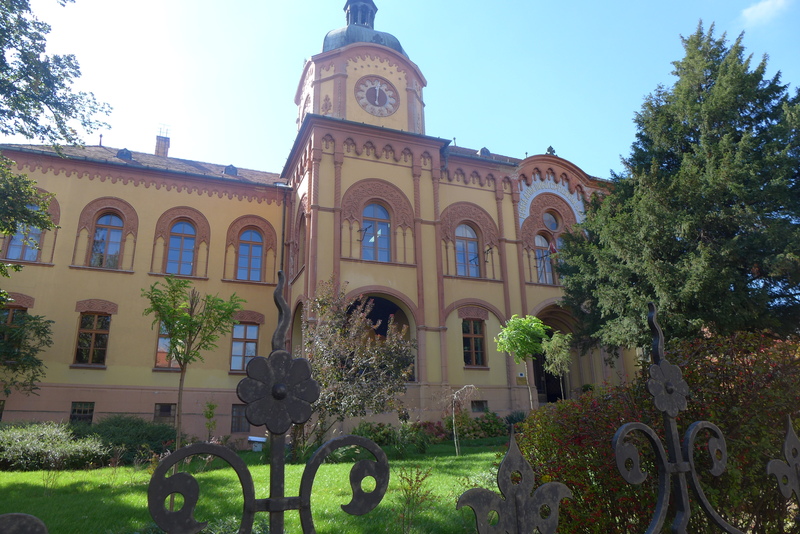 I wandered to the edges of town, where the houses ended and vineyards began, admiring the unique architecture that carried an evident Austro-Hungarian influence. Upon making my way back to the center, another elderly gentleman who had been sitting on the same bench earlier in the day noticed me and called me over. The extent to which we understood each other was, again, quite limited, yet everything evolved rather similarly to the first interaction I mentioned above. However, after shaking hands, instead of a continued series of polite gestures, he let go of my hand, reached into his inner jacket pocket, and pulled out a bottle of plum rakija. There it was. Those few hours I spent in Sremski Karlovci couldn’t have culminated in a more poetic procession. As I took a seat and shared a few sips with this gentleman, looking at him through the cloud of cigarette smoke that aggregated from the simultaneous puffing of the locals seated beside us, I realized that this small town, through its energy, appearance and human connection, combined with the events of that day, perfectly epitomized my “Serbian experience.” How best to explain this experience? Is it any different from my Slovenian experience, Montenegrin experience, or Croatian experience? Does hospitality carry nuances? Indeed it does. The best way I can explain my “Serbian experience” is in one word, Rusmir. This is what my one week in Belgrade revolved around, where I delved into the local culture and developed strong bonds to the people, the food and the city. Anyone who knows me relatively well should have probably guessed by now…Rusmir is a restaurant. 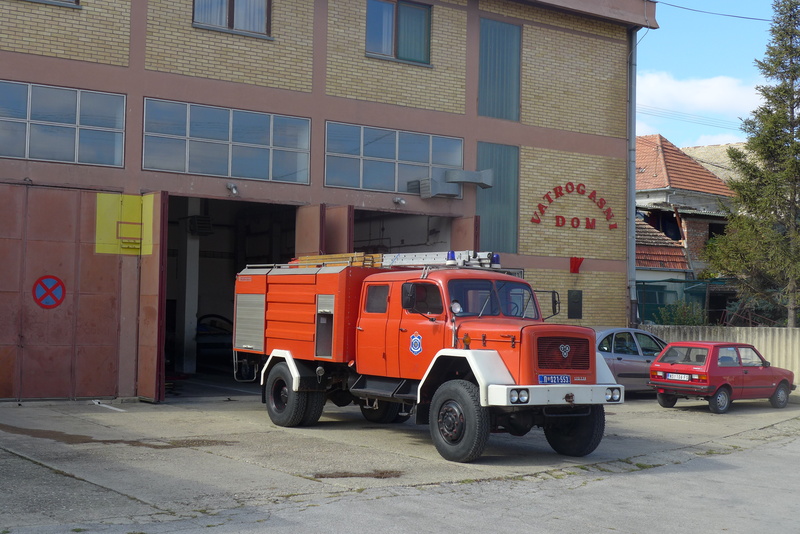 During my trip to Slovenia, I was put in touch with a Welsh chap in Ljubljana named John, whose blog and company I recommend to anyone lucky enough to cross paths with him. Now a dear friend, John is the main reason for my unique experience in Serbia, as he is the one who directed me to Rusmir. 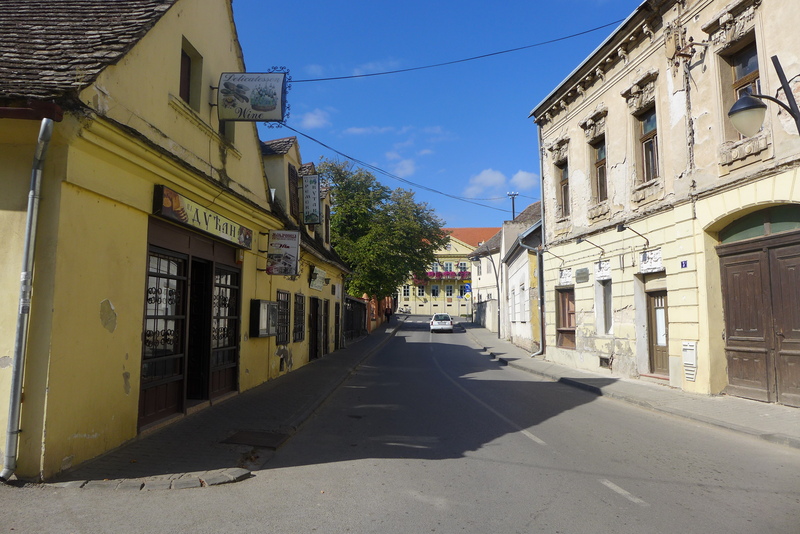 And as I am always in search of a good meal, I trusted his advice and took off on the 45 minute walk from Republic Square, through the busy town center, past the palatial Temple of St. Sava, to a desolate neighborhood. After a few minutes of walking through the dormant, residential streets, that welcoming sketch of a wild pig appeared from around the corner. 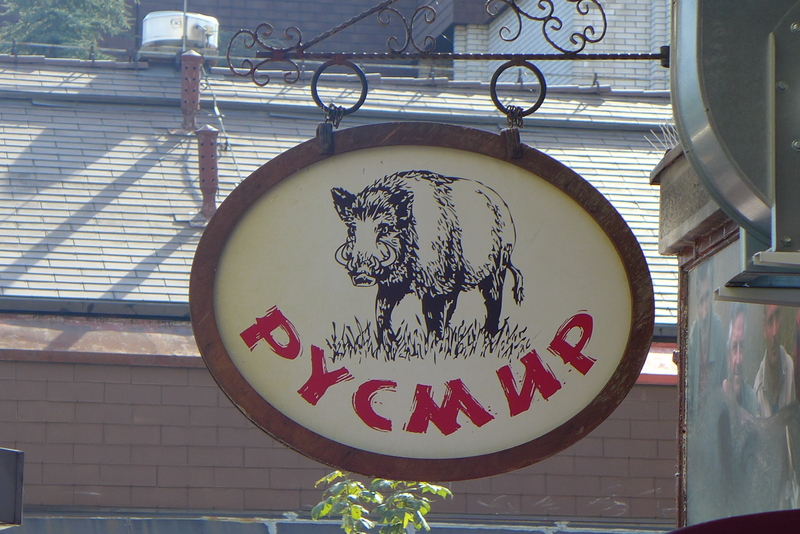 Specializing in pork dishes, Rusmir offers no menu. 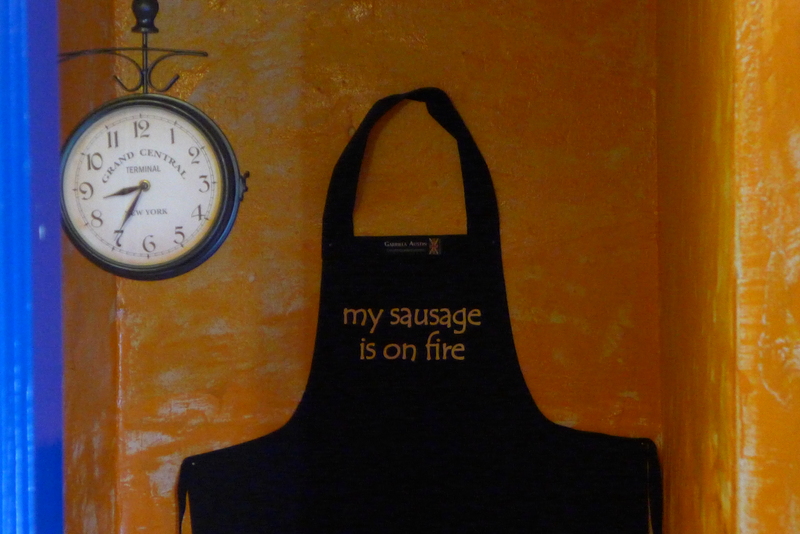 Someone from the lovely staff greets you with a smile, and as they set the glass ashtrays and paper place-mats on the table, you get one of two choices – sausage or ribs. One down. Next, a salad, made with tomatoes, onions, cucumbers and your choice – hot or sweet peppers. Finally, beer – Jelen or Nikšićko dark. Pretty straightforward. 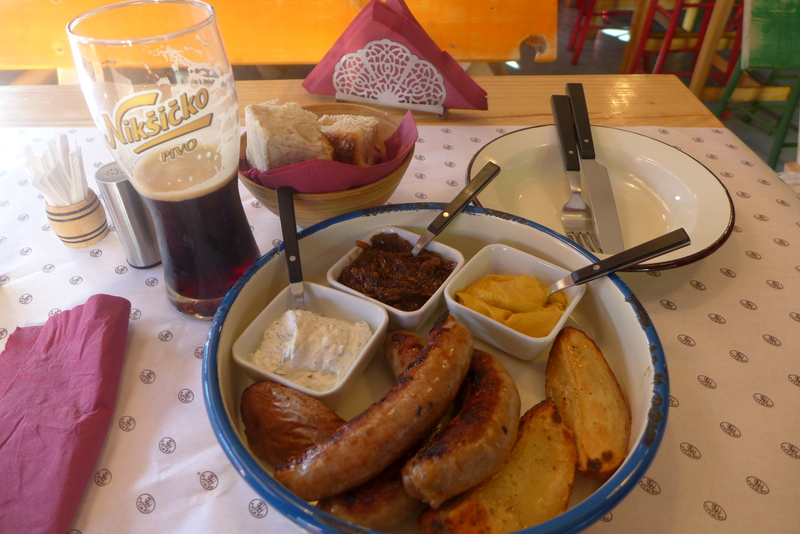 As it was my first day in Belgrade, I was sure this wouldn’t be my last visit, so I decided to start with a plate of their mixed sausages. These sausages were delicious! I couldn’t decide which ones I enjoyed best, and the crisp potatoes and perfectly paired sauces made for a rich, colorful plate. Needless to say, the next day I was right back! But this time, for the ribs. 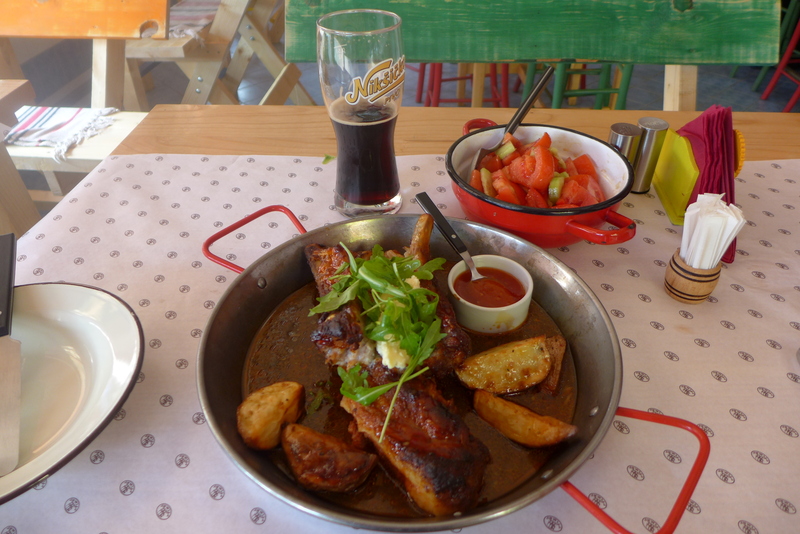 Pork ribs, swimming in a pool of succulent juices, with a side of the hot pepper salad and what has become one of my favorite Balkan beers. These were the best ribs I have ever had in my life. Without exaggeration. Usually ready around 2 pm, trays of these ribs cook for hours in large, new ovens that take up about a fourth of the tiny kitchen, consistently monitored with dedication and care by the young, friendly chef, Nenand. Unlike, rather quite opposite to, your average ribs, these were 90% meat with a few small bones poking out. And the meat was surprisingly soft, tearing apart like cotton to reveal a hefty portion of fat in between. Topped off with a healthy serving of kajmak, a mildly sweet clotted cream that falls somewhere on the spectrum between yogurt and cheese, and those crispy potatoes, it was a true feast. For six of the seven days I spent in Belgrade, I somehow managed to end up back at Rusmir. And each time, apart from the familiar faces of and conversations with the wonderful staff, I was graced with the presence of a unique group of truly incredible people. 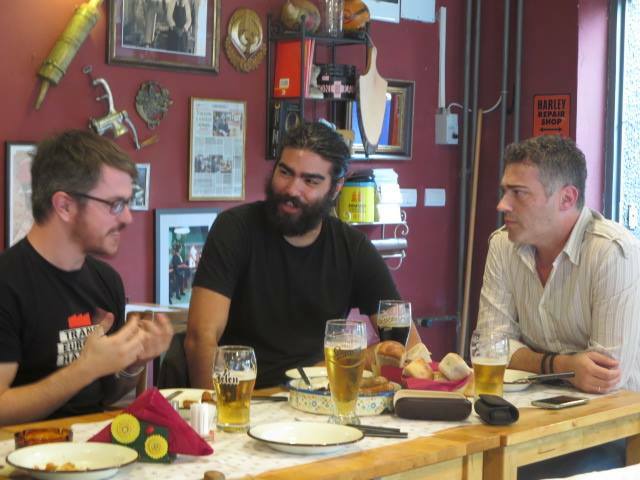 First off, as luck would have it, I received word from John that he was coming to Belgrade for business, and without really planning it, we ended up having lunch at Rusmir with his coworker, Sasha. Joining us was my hostel-hopping buddy, Amagi, a decorated traveler himself with a contagious charm and a gift for remembering everyone’s name. Here, I was introduced to another aspect of Serbian culture and hospitality. John, Amagi and I all met Sasha for the first time that day, and we spent a good two hours at the table, chatting pleasantly while slowly cleaning our plates. The conversation was very natural and warm, despite all of the new acquaintances. Then, suddenly, Sasha had to leave, and that would probably be the last time either Amagi or I would ever see him. After Sasha’s departure and a few more drinks, we were ready to pay the bill and leave, at which point we were told that Sasha had already taken care of it. This was truly a kind and respectful gesture, one that epitomizes the Serbs’ welcoming nature towards guests in their country, even those they would only meet once. So…on to rakija, because everyone loves to drink. And nothing brings people of Balkan culture together like filling their stomachs and straining their livers. This raspberry rakija we had above was John’s favorite, a selection made from months of trial and error, back from the days he called Belgrade home. Alas, another perk to having a local around. 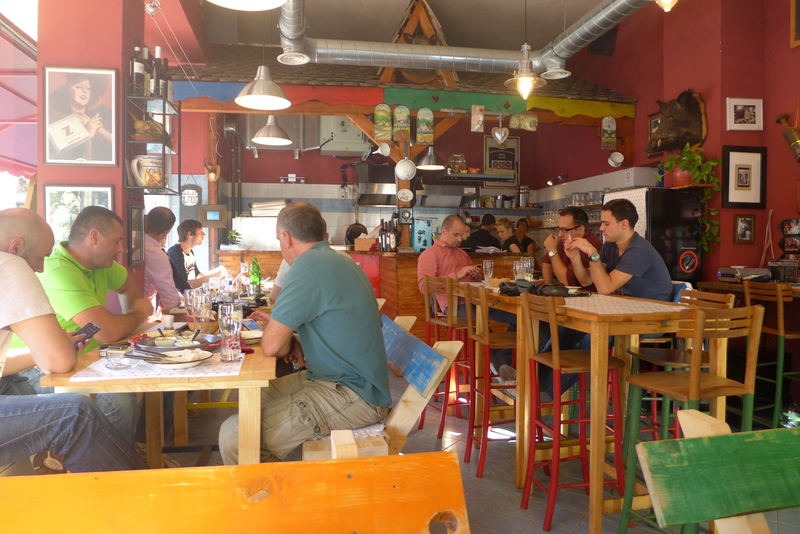 But just like the old man in Sremski Karlovci, and our lunch at Rusmir, many social interactions begin and end with servings of rakija, while sporadically interspersing a few in between. 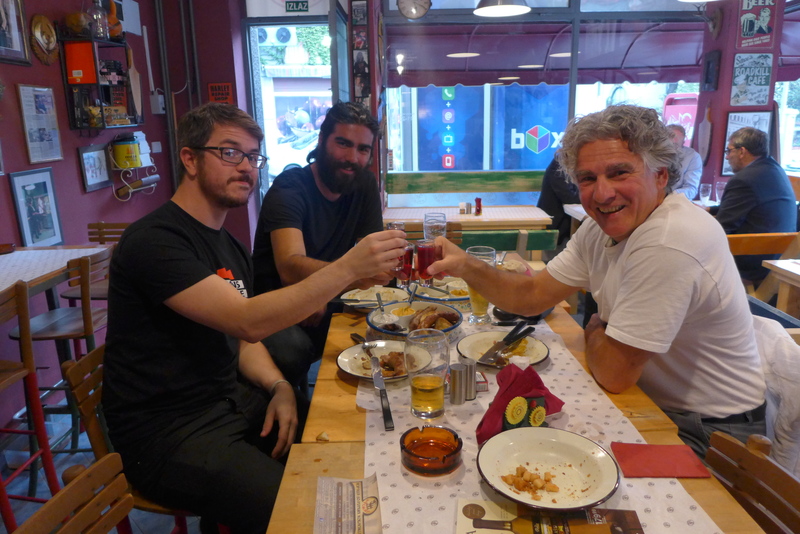 Following custom, when two close friends from Istanbul, Kaan and Mert, flew over to visit for the weekend, we experienced the same ritual with our hostel owner, who split a bottle with us and proceeded to give us a second to take home. And later the same day, when we arrived at, of course, Rusmir, we met the owner who offered us a few rounds in celebration of his 50th birthday (…and proceeded to give us slices of a creamy chocolate birthday cake that his mother had prepared). Rusmir. That word just about sums it about. All of the beautiful facets of Serbian culture wrapped up in one delicious experience. It embodies the unique energy of the city, the warmth of the social interaction, the fruits of a decorated cuisine, and the bonds that form over endless helpings of rakija. 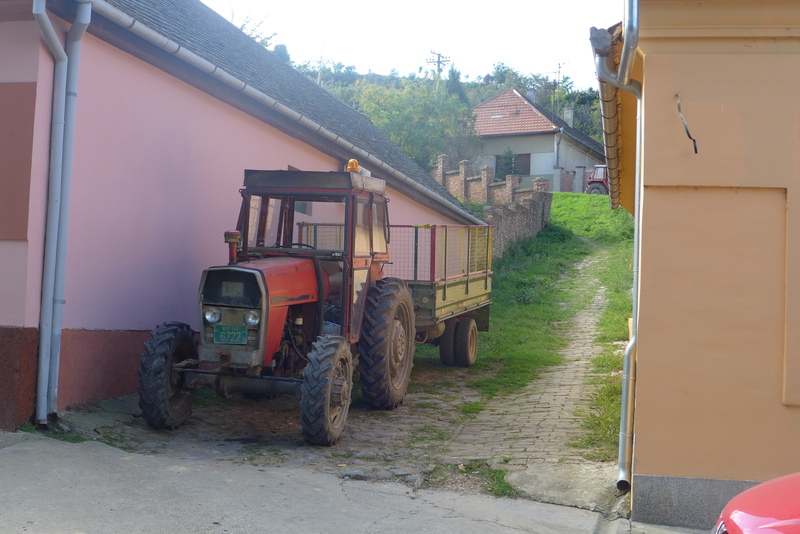 And all of these little nuances of hospitality, these characteristics of my “Serbian experience,” kept reappearing throughout my travels in Serbia, all the way to that little park bench in the tiny town of Sremski Karlovci. Nice photos, especially of the building with the clock tower.